Enzo Amore’s leopard-laden attire, creative metaphors and “G”-like gestures made him an instant favorite among NXT fans. Stick him with the “seven foot tall” Colin Cassady (Big Cass) and you had a hit. The duo ran roughshod for five years in “developmental” as fans pondered when they’d make their main roster debut. The Raw after WrestleMania 32 brought that day to a shiny reality. With the exception of Enzo’s return angle after his unfortunate Payback concussion, Enzo/Cass have sadly devalued their entertainment factor thanks to Raw’s lazy booking. Creative conceived the notion that people will love Enzo no matter what he does, even if he walks around naked, flirts with a married woman, pursues a hotel room hookup with her and gets a limousine from Ric Flair to drive to said hotel. Yes, that actually happened. Would you believe who was the babyface there? Nope, not the husband. Enzo. The married woman happened to be Lana and her husband Rusev. Their 2016 heel act had no fire (he’s foreign so we have to hate him by default?) and besides the hotel room/“Sensitivity Training” heel ambushes, this angle only made us think back to NXT when Enzo/Cass were hot. They’ve become synonymous with Raw’s third hour drat. Photo courtesy of Wrestling Inc.
WWE shook us for a loop with the brand split return announcement – a concept to make Raw and Smackdown separate entities. An idea that originally lasted from 2002 to 2011 assumedly ran its course, but with the WWE Network a content smorgasbord and a vast roster, what was there to lose? Perhaps overexposure for some. Instead of 12 monthly Pay-Per-Views, (“Big Four” of WrestleMania, SummerSlam, Survivor Series and Royal Rumble included), there’d now be 19 PPVs. Instead of Raw/SD alternating monthly PPVs, they’d each get their own. September had two PPVs. Same for October/December. This was WWE’s biggest 2016 flaw – more content’s not always better. Catching up with regular WWE TV has almost become a second unpaid job. We’ll lay it out for you. During a PPV week, you got a one-hour pre-show, three-hour PPV, three-hour Raw, two-hour SD, one-hour 205 Live and one-hour NXT. 11 hours of TV in four days. 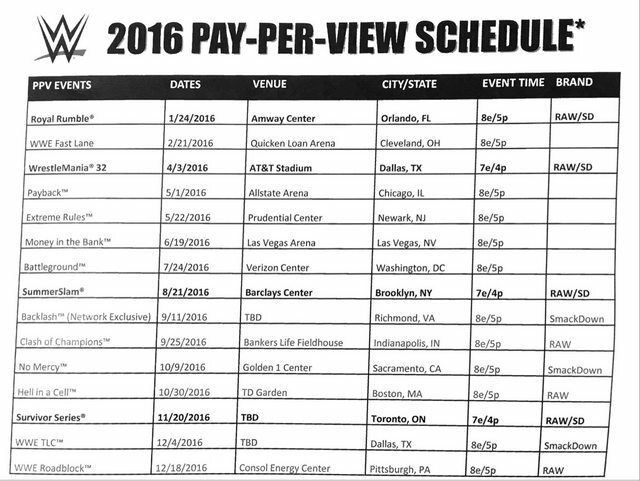 PPV weeks come every two weeks in a non-“Big Four” month. Still into the idea? Granted we’ve gotten solid shows like TLC and Backlash, but we also got duds like Clash Of Champions, SummerSlam and Hell In A Cell. If those shows were closely memorable, perhaps we’d be more enthused. That remains to be seen. Doesn’t look like it’ll change in 2017 either. WWE, we implore you – tone down the PPVs. Your fanbase will thank you. The irony of this was that TNA’s X-Division put the company on the map with aerial classics in their early days, while the Cruiserweight Division revival stemmed from the Cruiserweight Classic roster, an absolute treat to watch. In 2016, both divisions masked themselves as “can’t-miss, high-flying action,” but that was the problem. There was no ceiling to break, with the exception of Eddie Edwards, who broke free to eventually become TNA World Heavyweight Champion. It’s worse in WWE, where the Cruiserweights were literally given purple ropes and only interacted with each other. How killer would a TJ Perkins-Kevin Owens match be? Sami Zayn-Neville: The NXT TakeOver: R-Evolution rematch? Brian Kendrick-Seth Rollins? Raw did themselves a disservice as they segregated the Cruiserweights from the rest of the show. Both divisions presented an unbreakable bubble and pointless six-man tags in endless quantity. Don’t even get us started on Team X Gold. Towards the end of 2016, we got 205 Live, a watchable run for Swann as Champion and a great Neville heel return. While we finally had some storylines, they’ve got a long way to go as far as character development. As for the X-Division, Mandrews turned heel. We think. Do we even care? Let’s hope that changes in 2017. Don’t adjust your screens. Well, why would you anyway? The longterm idea to stick Adam Cole with The Bullet Club made sense. He had history with The Young Bucks (Mount Rushmore Of Wrestling anyone?) and fit their rebel attitudes. This angle had its shock value, but we didn’t care for how it occurred. First, you had a main event Title match for the ROH World Championship people wanted to see between Jay Lethal and Colt Cabana, in Chicago no less. This was also a PPV that people paid to see. Instead of a match finish, we got the reveal as it “hijacked” the show, similar to Nexus’ debut angle. Everyone was superkicked into oblivion – cameramen, commentators, security, other talent. Sure, it was flashy and the “Superkick Counter” graphic was cute, but it overexposed the novelty of the superkick. We also didn’t like that Cole was again put in the forefront of another group to get over. His heel act elevated when he became Champion, but it’s hard to buy into a heel group when half of them are heels. The longtime BC flaw was first introduced with this angle. Imagine how much better it would’ve been had it happened after the match and YB actually turned on the fans too. Oh, what could’ve been. 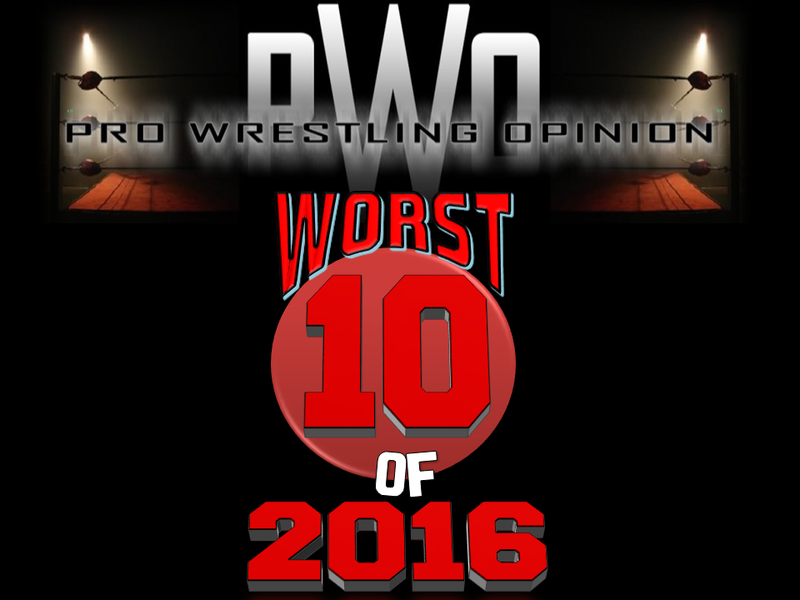 As if the never-ending BJ Whitmer-Steve Corino feud couldn’t just get its one-and-done payoff, they found a way to stretch it into 2016. With an embarrassing Dungeon Of Doom rehash, we got a partnership between Whitmer/”Father” Kevin Sullivan as they put monster rookie Punishment Damien Martinez under their wing. Sullivan rambled on like a wannabe Obi-Wan Kenobi to try to also get Corino to “join them.” Evil, get it? No, neither did we. Not only did this feel out of touch with the rest of ROH’s storylines, it was almost an eye roll to try to see them go the bizarre route. It just didn’t work and they didn’t let it go. Luckily, there seemed to be a light at the end of the tunnel with Corino headed to WWE in 2017. Let’s quietly disassemble this dastardly trio and let Martinez do his thing, huh? Lucha Underground “Owner” Dario Cueto was a ruthless money-lover, eager to spike up the competition for his need to raise business. His brother was a scorned individual, likened to growls behind cage bars for most of season one and occasionally feasted on humans or something like that. He was ready to be unleashed during Aztec Warfare II, where hearty babyface Fenix (Champion at the time) came in at number one and defended. We expected Matanza to have an impactful debut, but the idea that he’d pin every babyface in the company to that point to leave as LUG Champion stretched it a little. On top of that, his wrestling skills were non-existent and he looked like a killer janitor. You could practically feel the enthusiasm slip from the Temple as fans were reduced to pointless squashes of all their favorites, as nobody could defeat the monster. That aside, his run as Champion (as well as in-ring skills) improved in Season three with the “Dial Of Doom” as his defenses became an opening act attraction before he was uncrowned in Aztec Warfare III by Rey Mysterio Jr. However, that’s not to excuse his introduction and all it could’ve been instead of what it was. A lot of season two negatives are filled with utterances of Matanza and we can’t say we blame them. Shane McMahon’s hot return instantly gave a tiresome formula a much-needed fresh feel. Within 20 minutes, we learned that Shane would risk his life to try to run Raw as his father booked him into a Hell In A Cell match at WrestleMania against The Undertaker. With the stack seemingly decked, we saw Shane undergo intense mixed martial arts training to combat Taker’s Triangle Chokehold submission. While “Super Shane” can be ridiculous sometimes, there was intrigue in seeing if he could beat Taker and assume control of Raw. The match was forgettable besides for a needless bump that saw Shane drop from the roof through an announce table below. As we figured, Taker won and Shane was out. The next night on Raw, Vince was like, “This is so ridiculous, but you know what, you want to run Raw? You got it!” which meant that all that build was for naught if the plan was for Shane to run the show anyways. This delved into the authority figure nonsense that’d lead into the brand split, but we can’t forgive and forget this one. They could’ve salvaged it if they had Vince impressed by Shane to spark the move, but that wasn’t even the case. He basically gave him the show because he wanted to see him screw it up. At one point, Titus O’Neil was a formidable talent who rose through the ranks as a midcard babyface with big support outside the ring for his noticeable charity work. He was even 2015 “Celebrity Mega Dad Of The Year.” Conventional wisdom would dictate that O’Neil would work his way to the main event scene with a future Title run, but an unfortunate circumstance onstage with Vince after a Raw episode began his downfall to the underlings. He turned heel (questionable) and instead of momentum, he lost at every turn. His gimmick as “The Titus Brand” was odd, as he spoke how it’d be “on everything from fashion to television” and didn’t go further than that. He also continued to lose every match. Even if he wasn’t directly involved, he was still portrayed as a loser. He held press conferences attended by one person. How well could that possibly go over? 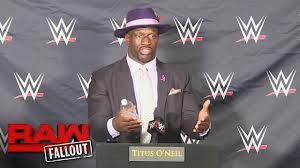 With no attempts to get O’Neil out of this mess, we’re afraid of what the “Titus Brand” might be when WWE actually figures it out. Even the Walmart brand’s better. Either give him a monster heel run or turn him back and let him connect with the fans again. When Luke Gallows/Karl Anderson came to WWE from New Japan Pro-Wrestling as “The Club” with AJ Styles, fans thought up countless booking scenarios as the trio skipped NXT and went straight to the main roster. Guarantee that none consisted of “Ringpostitis” or “The Old Day.” After a stop-and-go push as brash heels, they turned them into comedic testicle-obsessed “doctors” as they feuded with The New Day over the WWE World Tag Team Championships. 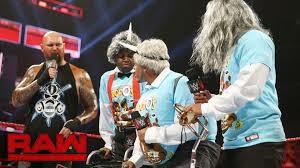 The feud’s biggest culprit was the long, infamous “Old Day” segment where Gallows/Anderson brought out three actors to portray the Tag Champs as elderly, based off their new initiative to become “retirement specialists.” There were “pee-pee” jokes, slowed-down theme music, a miniature trombone and a crowd bored to death. The total silence until ND’s arrival (which didn’t end the misery like it should’ve) should tell you all you need to know. Luckily, they turned Gallows/Anderson back to “Fun Killers,” as any idea of them as comedic heels went up in a sad inferno of shame. Shame. 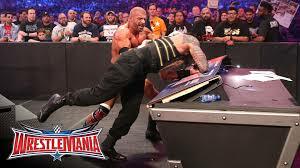 For two years, WWE fans voiced their displeasure for the babyface shoved down their throats (2014 – Batista, 2015 – Roman Reigns) and the company altered their WrestleMania main event plans to appease them. Vince wasn’t having it in 2016. Reigns was still booed by many as he lost his Title to his own boss at Royal Rumble and was in chase mode. Many people didn’t want this match to begin with and Triple H as a World Heavyweight Champion in 2016 was just strange. Leave it to WWE to book a boring main event in the most-attended WrestleMania. 101,000 people were in AT&T Stadium to a major dud of a main event. Not the best way to cap off a “seven-hour spectacle.” People feared that Reigns would win and it was obvious from the get-go, so there was no way they’d buy into this match. Besides for the “Game Of Thrones”-esque entrance by Triple H/Stephanie McMahon, there was nothing tangible here. Most of the action was ground-based, which didn’t help things in a 27-minute bout. WWE tried to get one over as they piped down the crowd audio during Reigns’ entrance and the match, but all it did was make it come off more boring to those at home. Reigns’ comeback was utterly anticlimactic and his win was met with happiness more because it meant the show was over than people genuinely excited for his victory. When the main event of your biggest show’s met with boos and “meh” to be polite, there’s no other spot on this list where it belongs. Posted on March 22, 2017, in Lucha Underground, ROH, TNA/Impact Wrestling, WWE and tagged Adam Cole, Aztec Warfare, Big Cass, BJ Whitmer, Brian Kendrick, Colt Cabana, Cruiserweights, Eddie Edwards, Enzo Amore, Fenix, Global Wars, Jay Lethal, Jinder Mahal, Karl Anderson, Kevin Sullivan, Lana, Luke Gallows, Matanza Cueto, NXT, Pay-Per-Views, Punishment Damian Martinez, Raw, Rich Swann, ROH, Roman Reigns, Rusev, Shane McMahon, Smackdown, Stephanie McMahon, The New Day, The Old Day, The Undertaker, Titus O'Neil, TJ Perkins, TNA/Impact Wrestling, Triple H, WrestleMania 32, WWE Brand Split. Bookmark the permalink. 3 Comments.